Lionel Messi scored with an unstoppable free kick to help Barcelona come from behind to beat Sevilla 2-1 on Sunday, a record-equaling 34th game without loss that kept the champions on track to retain their Spanish league title. Sevilla’s Victor “Vitolo” Machin struck first for the visitors in the 20th minute, but Messi curled home his free kick 11 minutes later before Gerard Pique put Barcelona ahead just after halftime. Barcelona equaled Madrid’s record unbeaten streak in all competitions from 1988-89. Barcelona’s last loss in any competition was at Sevilla on Oct. 3. Luis Enrique’s team is certainly on course to win the league. In fact, it has a chance to repeat its rare treble of league, cup and Champions League trophies from last year. Barcelona’s 10th consecutive Liga win maintained its eight-point lead over second-place Atletico Madrid. Third-place Real Madrid, which lost 1-0 to Atletico on Saturday, fell 12 points behind the pacesetters with 12 rounds to go. Sevilla, which remained dangerous until the final whistle, slipped down to sixth place. Unai Emery’s team will have the opportunity to avenge the defeat when they meet Barcelona in the Copa del Rey final on May 22. Elsewhere Sunday, Villarreal eased to a 3-0 win over 10-man Levante to cement its hold on fourth place, while Athletic Bilbao won 3-0 at Valencia in a preview of their Europa League round-of-16 clash. Granada eked out a 1-0 win at Deportivo La Coruna in the debut of coach Jose Gonzalez to escape last place and push Levante to the bottom. While Sevilla made no attempt to hide its intent to defend and counterattack, Barcelona mustered the first scoring chances with two strikes that hit the woodwork in the 13th minute. Messi was first, sending a corner kick toward the near post that defender Coke Andujar was lucky to head onto the upright and not into his own net. The rebound then fell to Luis Suarez near the edge of the box, where he blasted it off the bar. Having dodged Barcelona first shots, Sevilla stunned the Camp Nou crowd with a finely executed move that started from an apparently harmless throw-in. Benoit Tremoulinas put the ball in play, weaved together two passes with teammates, and found himself unmarked on the left flank. His cross was then volleyed beyond goalkeeper Claudio Bravo by Vitolo. Sevilla held firm at the back, until all its discipline in defense was undone by Messi after Suarez earned a dangerous free kick on the edge of the area. The Ballon d’Or holder did the rest, bending a left-foot shot over the wall and into the net, giving goalie Sergio Rico no hope of making a save. Messi, who scored both goals in Barcelona’s 2-0 win at Arsenal in the Champions League on Tuesday, recorded his 30th goal of the season in all competitions. 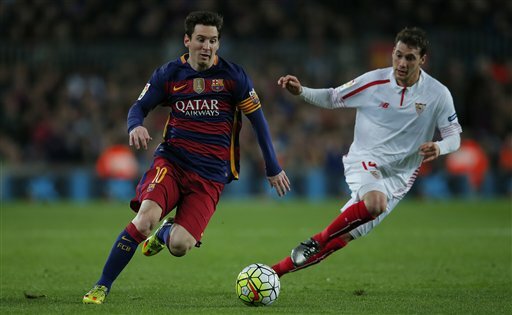 After his goal, Messi was the motor in Barcelona’s attack, which hemmed Sevilla into its area. Sevilla got a reprieve at halftime, but Barcelona didn’t have to wait long for Suarez to exchange passes with Messi before slipping the ball over for Pique to score from close range in the 48th. Both sides then needed their ‘keepers to shine. Bravo was first to deny Kevin Gameiro before Barcelona went straight down the other end and Messi drew a great save from Rico. Sensing that his team needed control more than another goal, Messi shifted gears and focused on keeping possession of the ball to disarm Sevilla’s rally.